When I first started the strip down of my Porsche 944 in 2016 the plan was to replace the fuel lines and brake lines. In the event I also found other corrosion that required a much bigger job including welding both the sills. 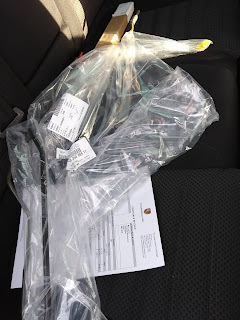 Once the welding had been completed and I came to purchase new fuel lines I found that parts of them were no longer available from Porsche UK so I had to look at alternatives. As outlined in this blog post I bought some 8mm and 10mm copper tubing along with connectors to fit them. They did the job and got the car running as well as passing the MOT for the last couple of years. However I was never totally happy with the fit as it was very hard to get the lines to have the correct profile with all the turns under the body through the wheel arch. I found out today that the lines are back in stock with Porsche UK so I've got them on order and should have them ready to fit this weekend. Update - just picked up the new fuel lines. They weren't cheap at £162 but well worth it to have lines that correctly fit the underside of the car. The part numbers for the 2 pieces of the fuel lines for my 1986 Porsche 944 2.5 NA car are P944 356 969 11 for the supply line and P944 356 937 10 for the return.